Bath Salts are a very useful way to help heal the body while enjoying a soothing bath. Epsom salts - we source ours from eastern Washington state - have a powerful drawing action that pulls toxins from the skin, muscle, and even stored fat cells! That is why we only offer this product in our all natural scents. 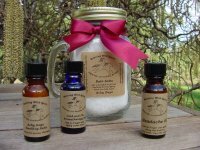 If you would like bath salts with a fragrance oil scent we can do this per your special request. Soothing for irritated skin and calming for rattled senses. Ingredients: epsom salts, coarse sea salt, essential oils (lavender).